In July, the Federal Emergency Management Agency (FEMA) released a startlingly candid report on its own shortcomings during the 2017 hurricane season when three huge storms walloped the eastern U.S. and Puerto Rico in quick succession. While that suggestion may come as a surprise, even shock, to many Americans, emergency response leaders have been well aware that there needs to be a major shift in disaster giving and response to address big gaps in relief initiatives. 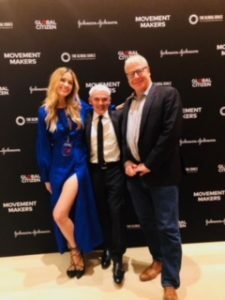 In a move toward that ambitious goal, Good360, Global Citizen, and All Hands and Hearts – Smart Response have launched an initiative called Resilient Response, aiming to spotlight the critical need to adjust disaster giving behaviors among corporations to better support response and long-term recovery. The campaign was timed to coincide with the one-year anniversary of Hurricane Maria, which brought the worst devastation to Puerto Rico on record. It also launched in the aftermath of Hurricane Florence, which caused $17 to $22 billion in damage (an estimate that could prove conservative). According to recent studies, current disaster giving is terribly misaligned with what’s actually needed to rebuild impacted communities for the long haul. Some 70 percent of giving today happens within the first two months after a natural disaster, while only 5 percent of donations is allocated to reconstruction and recovery. Yet, it can take communities an average of five years to recover — or at least a decade, in the case of post-Katrina New Orleans. By shining the glare on corporate giving, we hope to activate large-scale changes in philanthropic activities that measure in the hundreds of millions of dollars every year. It’s an effort we’ve already started by establishing the Good360 Disaster Recovery Council, and inviting corporate leaders such as The UPS Foundation, United Airlines, Ecolab, and CVS Health to to share their best practices. 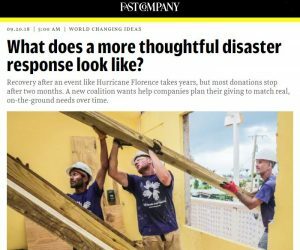 “We’re doing a lot of work with corporate donors to get them to think about the cadence of giving, and how they can give in a way that’s really aligned with need, and doesn’t contribute to waste,” said Good360 CEO Howard Sherman in an article (“What Does a More Thoughtful Disaster Response Look Like?”) that appeared in Fast Company. 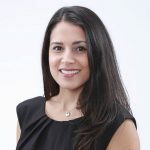 “It’s not just enough to send goods — you have to think about how those goods are going to be distributed responsibly on the ground,” Sherman added. The core of the Resilient Response campaign is a six-point pledge that creates a framework for companies to consider as they craft their disaster response strategies. In addition to the article in Fast Company, the campaign was spotlighted in a five-minute segment on CNBC. Host Brian Sullivan conducted a live interview with Sherman and Nemcova. Just days later, Sullivan announced on his CNBC show that after seeing the segment, a viewer pledged to donate $1 million worth of in-kind products to Good360, partly to help support future long-term disaster recovery efforts. We are beyond thrilled to receive this donation. We also know that a lot of work lies ahead to shift the current thinking around giving so that we can build more resilient communities after a natural disaster.We urge companies and individuals to take the pledge today to ensure we’re all working toward a more thoughtful and sustainable response when disaster strikes.